One of the best ways to breathe new life into a familiar space is with the timeless beauty of wallpaper. From vivid color palettes to stately prints and patterns, these eye-catching designs showcase your personal sense of style and make a statement all their own. Wondering if wallpaper is the right choice for your home? We’ve got you covered (no pun intended) with our comprehensive wallpaper buying guide. Trying to decide between paint and wallpaper for your walls? When it comes to refreshing your home interior, wallpaper has some definite advantages despite its difficult reputation. For instance, wallpaper is much more durable than paint and is particularly ideal for high-traffic areas. In fact, it’s not uncommon for wallpaper to last for well over a decade. Painted walls, on the other hand, often need a fresh coat after five years. Wallpaper is also an excellent choice for older homes, as it can cover existing wall imperfections more easily than paint alone. Even better, more and more wallpaper designs are now available in removable options, so you can experiment with different designs minus the commitment. There’s no question about it, when it comes to wallpaper for walls, one size does not fit all. Although this can be taken quite literally, it also means there are several different types of wallpaper. This is true not only in texture, design, and color, but also in the way that it is applied to the wall. When it comes to application, there are three main types: pre-pasted, non-pasted and self-adhesive. Pre-pasted wallpaper is the most common type of wallpaper you’ll find. These designs are pre-coated on the back with an adhesive that’s activated with water. If you’re a newbie to wallpapering, this is an easier option for you. However, while it’s easier to apply, it doesn’t last quite as long as non-pasted wallpaper which means you may have to reapply wallpaper in a few years. This pre-pasted wallpaper is a charming backdrop with the warmth of organic woodgrain. Traditional wallpapers don’t come with a pre-coated paste, which means you have to apply your own adhesive to their backside to get them to adhere to your walls. This can be trickier and more time consuming for people who are not experienced in applying wallpaper. However, the benefit of non-pasted wallpaper is that it lasts longer. Removable wallpaper is a contemporary innovation that gives homeowners and renters alike more styling flexibility. These designs are self-adhering and can be removed at any time with ease. Specifically designed for short-term use, they usually last between three to five years and are a wonderful option for those who like to experiment with different styles. The most popular style of wallpaper available today is vinyl – and for good reason. This versatile paper is a practical choice for homeowners who want something that’s both durable and affordable. You can also wash vinyl designs and they’re fairly resistant to fading over time. Textured and embossed wallpaper is a fantastic way to add visual dimension to any space. Many of these designs are paintable, which adds to their overall versatility. They’re also a smart choice for damaged walls, as their texture can disguise existing imperfections. Textile wallpapers are typically made of fine fabrics and materials like silk, linen, felt, cotton, or raffia. Luxurious and oftentimes pricey, these styles are a high-end choice for the most special areas of your home. If you’re looking for an environmentally conscious approach to decorating your walls, bamboo wallpaper is an excellent (and stylish!) choice. This eco-chic paper maintains its color well and is actually antiseptic by nature. That being said, it’s also susceptible to moisture damage and should be avoided in bathrooms, kitchens, and high-traffic areas that require frequent cleaning. When it comes to shopping for wallpaper, there are several considerations you’ll want to keep in mind. For starters, it’s important to choose a wallpaper that’s designed for its intended room placement (e.g., a moisture-resistant or washable vinyl design for the bathroom or kitchen). If the space you’re papering is small, stick to similarly petite prints and lighter hues. Papering a large living room instead? 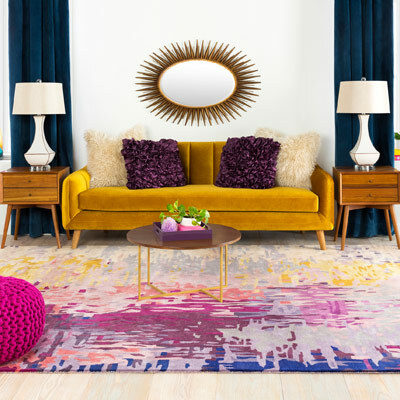 Feel free to opt for bolder designs and richer color palettes. Some popular wallpaper prints include patterns like buffalo or checkered wallpaper, designs like floral wallpaper or mural wallpaper, as well as many other shade and color variations. Vertical stripes can make a wall look taller in an instant and are particularly ideal for rooms with low ceilings. On the contrary, horizontal lines can make a narrow or cramped space feel more open and wide. Textured wallpaper is a clever way to disguise imperfect walls, and it’s a fantastic choice for older homes. Figuring out how much wallpaper you’ll need doesn’t have to be complicated. You can either crunch the numbers yourself or enter your project dimensions into our handy calculator. We highly recommend purchasing one extra roll of wallpaper, as well. This ensures you have enough paper to complete your project, and you can always return the extra roll if it goes unused. Before you begin, it’s important to make sure you have everything you need right in front of you. Start with the wallpaper of your choosing and its recommended adhesive and primer. You’ll also need a flat surface to work on, a paint roller with a tray, a sponge and bucket, a utility knife, putty knives, some rubber gloves, painter’s tape, sandpaper, a smoothing brush, drywall compound, a straight edge, a level, a seam roller and a pencil to make any marks as needed. Finally, consider having a small paintbrush on hand for applying adhesive to small areas. Wallpapering is an extensive process with several time-consuming steps, including cleaning and prepping the walls, applying primer, measuring and cutting the wallpaper, and arranging it on the walls. As a general rule of thumb, it’s best to allow yourself a full day to complete any wallpapering projects. First, fill a bucket with warm water. Using a sponge, clean the walls and allow the surface to dry completely. Once dry, use sandpaper to buff any rough areas or imperfections. Drywall compound is a great way to even out any dented or damaged areas on older walls. (Just apply it with a putty knife and let it dry for a full 24 hours before sanding it down.) Once your walls are clean and sanded, place painter’s tape along the trim and apply primer. Let your primer dry for at least a couple of hours before hanging the wallpaper. Step 1: Use your pencil, level, and straight edge to make sure the wall lines are even. Mark the wall accordingly where you wish to apply your wallpaper panels. Step 2: Measure and cut your wallpaper to fit the space, but leave an extra four inches in vertical length to allow for any mistakes. Step 3: Roll out the wallpaper panel upside down on a flat surface and either activate or apply the adhesive. Step 4: Stick the panel to the wall, leaving extra paper along the top and bottom. Step 5: Use your utility knife to remove excess paper along the top and bottom edges. Step 6: Complete this process until your walls are paper completely. Step 7: Finally, use a seam roller to press all the seams together. Keep your wallpaper looking new by dusting it with a dry cloth on a regular basis. You can also use a damp sponge to clean it more efficiently as needed. Avoid scrubbing too hard, and steer clear of chemical-based detergents and dyed cleaning products. Think wallpaper only belongs on walls? Think again! There are countless creative ways to utilize your favorite prints throughout your home. Liven up the inside of your kitchen cabinets and drawers with wallpaper liners, or brighten an old bookcase with a wallpaper background instead. Build a statement-making staircase by placing wallpaper accents on the risers, or elevate the look of a neutral closet with a wallpaper backsplash in your favorite hue. Many people use wallpaper for their ceiling to create a surprising accent to the room. You can even use wallpaper to revamp the look of an old coffee table or shelves. Prefer a simpler approach? Just frame your favorite wallpaper pattern and hang it on a bare wall for artwork on demand. Wallpaper isn’t permanent, although removing it can prove challenging. Several techniques exist to strip wallpaper, and the right one largely depends on the type of wallpaper you’re removing. Liquid stripping concentrates and steam-stripping, for example, are both popular methods of wallpaper removal. If you’re unsure of which technique is best for your needs, you may want to consult with a professional. Painting over wallpaper is a tricky process, but it can be done successfully with a little know-how! Just make sure you thoroughly clean the walls before applying any paint, and inspect all of the edges and corners to make sure nothing needs re-adhered before you begin. Do I need a wallpaper installer? Deciding whether or not to hire a professional wallpaper installer really comes down to your experience level and the project itself. If you’re a wallpapering beginner, it’s a good idea to outsource the work to someone who’s more comfortable with the process. Hiring a skilled pro is also a smart idea if a project is particularly demanding. If you’re hanging removable wallpaper or papering a single accent wall, however, you may just want to utilize your own DIY skills!